Some Lagosians on Wednesday called on the governor of Lagos state, Akinwunmi Ambode to proffer solution to the debilitating state of Ojuelgaba bridge. This follows the accident recorded on Tuesday evening which led to the death of two persons. DAILY POST reports that a truck carrying plywood fell on three commercial buses and a private car under the bridge. 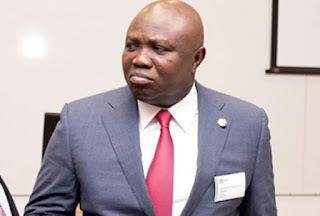 Reacting to the latest incident, Lagosians on social media called on the government to reconstruct the bridge, noting that such accidents have been recorded in the past. According to them, more accidents are bound to happen if nothing is done about the bridge and trucks that ply that axis. @Nijaactivist “Dear @AkinwunmiAmbode is it until calamity befall your household before you people enforce no movement without a strap for all these dead looking trucks. Do we need to champion this cause again? #RIP to the dead. “We can’t blame past governments when we have already seen twice this accident happened this year. Are you saying Ambode can’t enforce a law in a state he govern ?